The North American grasslands, or Great Plains, extend from Mexico, across the U.S., and into the three Canadian prairie provinces. The northern portion of this vast ecoregion is referred to as the Northern Great Plains and covers more than 720,000 km2, sweeping across five states and two provinces: Alberta and Saskatchewan. AWA’s vision for the grasslands is to conserve the full biodiversity of the grassland natural region and establish large contiguous areas of native grassland that are protected in perpetuity both for their intrinsic value and for the benefit of present and future generations. Because temperate grasslands are particularly suitable for agriculture, an estimated 99 percent of the non-urban grassland landscape is either under cultivation or livestock grazing. An estimated 57 percent of the Northern Great Plains remains untilled. Only about 1.5 percent of the Northern Great Plains is located in protected areas such as parks and reserves – less than any of the 13 other terrestrial global biomes, which average 7 percent. No protected area anywhere in the North American Great Plains has restored the full complement of native species and ecological processes,and unfortunately, this is not a management goal for any Great Plains protected areas. In Alberta, the Northern Great Plains in the southeast give way to the foothills fescue grasslands to the west and the northern fescue grasslands and aspen parkland to the north and northwest. Although it is facing enormous threats, Alberta’s prairie region contains some of the world’s best and most important remaining grassland. Only Texas and North Dakota retain a larger native prairie land base than Alberta. But today less than 1 percent of Alberta’s Grassland Natural Region is protected. A mere 150 years ago, tens of millions of bison, elk, pronghorn, and mule deer, thousands of birds and waterfowl, and many other wildlife species shared the prairies with wolves, grizzly bears, and other predators. 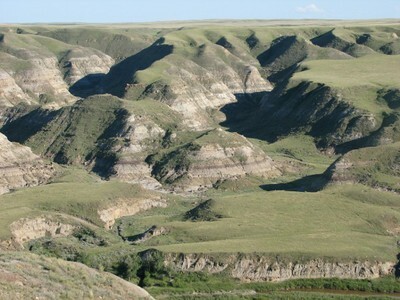 Glacial landforms, permanent and intermittent wetlands, badlands, sand dunes, and river valleys with coulees, ravines, and cottonwood forests created a diverse landscape. Spear grass, June grass, wheat grass, oat grass, blue grama, and rough fescue covered the land from horizon to horizon. The sad story of the decline of that rich landscape includes the displacement of wildlife, native plants, and First Nations people. Settlement, industry, and agriculture have had a devastating effect on wildlife, wild waters, and natural ecosystems. 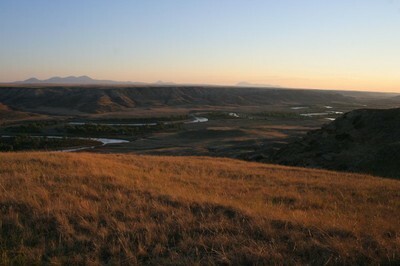 The grasslands region is now considered one of the most threatened ecosystems in North America. Most of the non-urban landscape of this region is either farmed or grazed by domestic cattle, with the additional threat of oil and gas development and its concomitant infrastructure of roads, well sites, and pipelines. Extensive fragmentation, invasion of non-native species, and loss of habitat is reflected in the number of endangered and at-risk grassland species in the southeastern corner of Alberta. In the midst of the overwhelming threats to this endangered ecosystem, there is good news: provincial, national and international initiatives to protect grassland species through conservation of their habitat are moving forward. Governments at all levels have recognized the importance of our grassland heritage, rural economies are needing and seeking renewal, conservation easements are increasingly popular, and much scientific research has been completed. AWA’s vision for the grasslands is to conserve the full biodiversity of the grassland natural region and establish large contiguous areas of native grassland that are protected in perpetuity both for their intrinsic value and for the benefit of present and future generations. To work at both public policy and grassroots levels. To encourage an informed and active public; to provide a strong base of easily accessible, historical and current public information on Alberta’s areas of concern. To create a network of colleagues, experts, and local citizens to encourage conservation and awareness of new economic opportunities. To promote ecosystem management and restoration of grassland and parkland ecosystems, including river basins. To promote the establishment of a core protected areas network. The government continues to sell native prairie for cultivation, allows increasing oil and gas operations and other industry to continue to fragment the region, resists formally protecting additional areas, and does a poor job at protecting those areas that are protected by allowing industrial activity to continue. Alberta’s grasslands have been increasingly altered and destroyed through sod-busting, invasive species, poor grazing practices, climate change, industrial agriculture, roads and other linear disturbances, and oil and gas. Wind farms and coalbed methane are more recent threats. The central parkland region has only remnants of native vegetation left with only a few opportunities for extensive protected areas. Large oil and gas reserves exist in the grasslands of Alberta and Saskatchewan. As of 2003, there were 104,000 active oil and gas wells in the Canadian prairies. Oil and gas activity and coalbed methane development continue at a rapid pace. The plains bison, once a keystone species of the grasslands, is for all practical purposes ecologically extinct. Of the 500,000 now in existence in North America, only 4 percent (about 19,000) are in conservation herds. None of the Great Plains herds are free-ranging. The long-term viability of these herds is compromised by small herd size, non-native diseases, unnatural culling practices, cattle gene introgression, and lack of a coordinated management strategy, among other factors. The black-tailed prairie dog, another Great Plains keystone species, has been reduced to less than 2 percent of its former range. In the U.S., it continues to be shot, poisoned, and hunted for recreation. The black-footed ferret, North America’s most endangered mammal, is found only in the Great Plains and now numbers approximately 400 animals in the wild. Sylvatic plague, introduced from Asia, threatens both prairie dogs and ferrets. Grassland birds are undergoing greater and more widespread decline than any other ecological guild of North American birds. Alteration of grassland fire regimes has had large-scale effects. Dams, irrigation, and other water diversions threaten rivers and streams. Non-native plant species (and non-native diseases) are invading the remaining native prairie landscapes. Roads and other linear disturbances continue to be constructed, fragmenting prairie ecosystems. Climate change has been identified as one of the key impacts to prairie biodiversity. A gradual reduction of tree and shrub cover is predicted, along with a decrease in mid-grasses and an increase in short-grasses. The current ongoing transfer, with no public involvement, of the public lands referred to as Tax Recovery Lands to municipal districts. This is resulting in the privatization of great tracts of native prairie. Possible dam development on the Milk River within the Twin River Heritage Rangeland Natural Area. EnCana’s proposal to drill 1,275 gas wells and associated infrastructure, including 22km of pipeline, in the Suffield National Wildlife Area, which was designated in 2003. A proposal to develop wind energy projects in a buffer zone around Cypress Hills Provincial Park that was designated by the county for native rangeland preservation. The proposed 24-hour opening of the Wild Horse Border Crossing, with the associated proposal that Highway 41 become a major transportation corridor to the oil sands. Sale of native prairie public lands without broad public knowledge and without commitment to the preservation of high conservation value native prairie. The Alberta government’s request to reintroduce the sale to end-users of 2 percent liquid strychnine after a 17-year ban due to concerns about human health and the incidental poisoning of domestic animals and at-risk species. In 2005, 16 bison were released in Montana’s high plains to roam wild as their ancestors did over a hundred years ago. With two more releases as well as the birth of calves, that herd totals 76 healthy bison (2009). Seventy bison were released in 2006 in Saskatchewan’s Grasslands National Park where bison had not roamed for about 150 years. The release of these wild bison into native prairie is part of a vision that has grown over the past two decades: to restore large portions of the Northern Great Plains to their former beauty and ecological integrity. Human communities of the Northern Great Plains are also at an ecological and economic crossroads. Drought, faltering agricultural commodities in the global market, and declining income are rapidly changing human demographic patterns in the area. As this socioeconomic transformation occurs, there is an opportunity to re-vision what the region can become. We can begin by rebuilding the biotic integrity of the grasslands while creating a more diversified and sustainable economic base for the region. Several studies have demonstrated that communities located near natural areas offering diverse outdoor recreational activities are more robust economically than communities that are not. The IUCN World Commission on Protected Areas (WCPA) promotes the establishment and effective management of a worldwide, representative network of protected areas. It recognizes that terrestrial grasslands are among the most diverse and productive of the earth’s biomes, yet have received very low levels of protection. With the population expansion and the rapid rate of industrial development in Alberta, the urgency of protecting and restoring the richness and diversity of our ocean of grass has never been greater. We know what is needed – now is the time for action. Establishing protected areas is central to conservation efforts, but surrounding buffer areas must also be maintained. Protected areas must be of sufficient size to allow for viable wildlife populations, and secure wildlife corridors must connect protected areas for the purposes of migration and population dispersal. Some of the longest reaches of undammed rivers in North America exist in the Northern Great Plains, providing opportunities to conserve representative habitat for fish and other aquatic and riparian species. 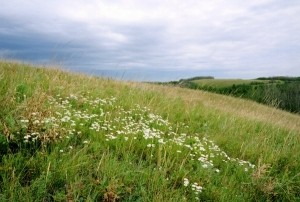 In Alberta, only 1 percent of the grasslands has been protected and the government aims to protect a mere 2.3 percent. This is a far cry from the 12 percent suggested by WWF’s Endangered Spaces program, and it also falls far short of the 8 percent of the Grasslands Region identified as priority lands by a provincial Special Places report. AWA has worked for many years to secure protection of public lands where specific conservation goals can be achieved. Conservancy organizations have worked hard at establishing conservation easements on deeded lands, helping to reduce fragmentation of habitat by filling in gaps public land does not cover. 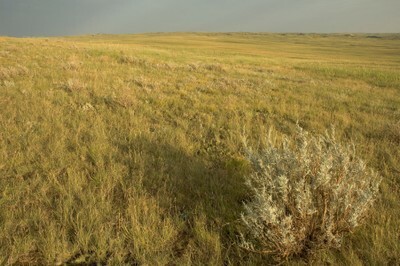 In a 1998 issue of Parks on the IUCN Grasslands Protected Areas program, Bill Henwood of Parks Canada, noted that temperate grasslands have long awaited their due recognition as valuable habitats worthy of protection and that many initiatives and programs indicated this emerging recognition. However, these initiatives often fail to address many grassland and parkland concerns and threats on the ground; these require local groups and citizens to take action, a role for which AWA is particularly suited. AWA is one of 40 members of the PCF which was formed in 1989 to implement the Prairie Conservation Action Plan (PCAP), a World Wildlife Fund five-year strategy to influence policy and attitudes for conserving, protecting and managing native prairie and parkland species, communities and habitats in Canada’s three prairie provinces. Successive five-year plans have been prepared based on a vision to ensure the conservation of native prairie, the recognition of its intrinsic values and its benefits for human communities, and a mandate to encourage local community involvement and ensure all stakeholders work cooperatively to achieve conservation objectives. The PCF’s goals are to raise public awareness and information about management issues pertaining to prairie and parkland landscapes, habitats and species; develop and implement broad conservation strategies and focused initiatives; influence government policies, programs and regulations that favour the conservation while preserving cultural and economic values; and adopt land-use management practices and protective strategies that sustain diverse ecosystems across the whole prairie and parkland landscape. Because the PCF is not advocacy-based, the membership and involvement of AWA and other conservation groups with PCF is vital. For more information, go to www.albertapcf.org. 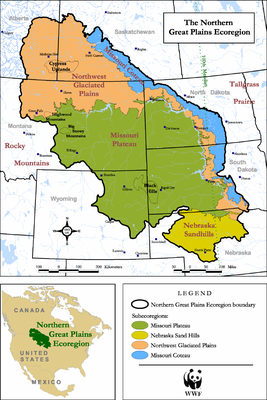 AWA joined with other grassroots, regional, and national conservation organizations in 2000 to form the NPCN in order to chart a future that integrates conservation with the renewal of the human communities and economy of the Northern Great Plain. The goal is to develop a vision and conservation plan for the Northern Great Plains to address the challenge of biodiversity conservation in the context of sweeping socioeconomic changes. Among NPCN’s principles for conservation efforts are promotion of sound stewardship of public and private lands, recognition of the cultural importance of land and wildlife for many people, the benefits of conservation for local communities and economies, and the importance of partnerships between conservationists and local communities. Expanding the amount of land designated as reserves or managed primarily for biodiversity conservation. Promoting ecologically sustainable management in both the agricultural and non-agricultural portions of the landscape that prevents further loss of native prairie, limits spread of non-native species, and leads to widespread adoption of grazing practices that restore and maintain native prairie habitats and species diversity. Restoring populations of native species and securing their long-term viability, including restoration of ecologically functional populations of bison. Ensuring that flows in the Missouri River system and its significant tributaries, including the Milk River, can support the full complement of aquatic and riparian species. promoting wide public involvement in the conservation, sustainable use, and equitable sharing of benefits of grassland biodiversity. Just as a forest is more than trees, a grassland is more than grass. But to best appreciate the biodiversity of the grasslands, one must settle in just before sunset and let the creatures go about their business undisturbed. Look up and watch the nighthawks diving for insects, accompanied by that inimitable two-toned hum of the wind across their wings. Enjoy the pronghorn’s proud silhouette on the horizon. Listen to the coyote howls and the wind whispering in the grasses. And watch the deer come down to drink from the precious streams and wetlands scattered throughout this semi-arid region. Alberta’s Grassland Natural Region, comprising four natural subregions, covers about 14 percent of Alberta, or about 95,500 km2. About 18 percent of the region is covered with permanent and temporary wetlands, and only 1 to 2 percent is occupied by water in major rivers and shallow lakes. Of what was once native, unploughed prairie in Alberta, only about 43 percent remains, and of the entire Grassland Natural Region, less than 1 percent is protected. Grasslands are not as flat as is often thought. Much of the Grasslands Natural Region comprises undulating plains. Hummocky terrain is found in the northern portions, rolling hills in the west, and badlands and exposed bedrock along river valleys. Elevation ranges from 800 m (Dry Mixedgrass Subregion) to 1,525 m (Foothills Fescue Subregion). Alberta’s grasslands contain grass-covered uplands, lush river valleys, permanent marshes, temporary wetlands, shallow lakes, and sand dunes and plains. This combination of diverse habitats supports a wide diversity of life, each species adapted to its own specialized niche. The Grasslands Natural Region is known for its high concentration of species listed as Special Concern, Threatened, Extirpated, or Endangered by Canada’s Species at Risk Act. The October 2008 joint federal-provincial hearing for EnCana’s proposed infill project in the Suffield National Wildlife Area brought attention to several of those species, including the Ord’s kangaroo rat, the Sprague’s pipit, and three endangered prairie plants. Alberta’s grasslands contain many animal species found nowhere else in Alberta, including swift fox, great plains toad, several species of tiger beetle, yucca moth, and mountain plover. 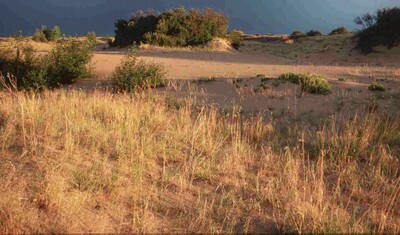 The dunes near Blindloss are home for the most northerly population of Ord’s kangaroo rat. Living at the edge of its habitat makes this species particularly vulnerable. About 25 percent of Alberta’s rare vascular plant species occur in the Grasslands Region, and about 55 rare species occur in Alberta only in the grasslands. Trees and shrubs grow only along rivers and streams, and in terrain that is protected from the desiccating winds and hot summer sun. As one moves north and west from the semi-arid, largely native prairie of southeastern Alberta, moisture increases and the land merges with extensively cultivated prairie areas – most of the native biodiversity has been lost in these areas. “Mixedgrass” refers to the mixture of short and mid-height grasses. The most widespread grasses in this subregion are blue grama, needle-and-thread, June grass, and western wheat grass. In spring and summer, many species of wildflowers are sprinkled among the grasses. Shrubs include silver sagebrush, silverberry (also known as wolf willow), buckbrush, and prickly rose. Along river valleys, tall forest and shrub communities thrive, including plains cottonwood, willow, and thorny buffaloberry. Climate is similar to the Dry Mixedgrass Subregion, with slightly cooler and moister conditions. Dry, sandy sites contain needle-and-thread grass, northern wheatgrass, sand grass, and June grass. On moister soils, blue grama grass, needle grasses and northern wheat grass thrive. Species on the slopes of the Cypress Hills include plains rough fescue, western porcupine grass, and sedges. Ravines, coulees, and other sheltered areas provide habitat for shrubs, including buckbrush, silver sagebrush, silverberry, and prickly rose. Tree species include plains and narrowleaf cottonwood and balsam poplar along the Oldman River, and balsam poplar in the Cypress Hills. Grasses on the driest sites include blue grama, northern wheat grass, sand grass, and June grass. Moister sites contain western porcupine grass, plains rough fescue, northern wheatgrass, and porcupine grass. Other plant species include balsam poplar, aspen, plains cottonwood, willow, sedge, bulrush, and common cattail. This subregion is characterized by cooler summers, a shorter growing season, warmer winters, and more precipitation than the other three subregions. Herbaceous plants are diverse, including species not common in other subregions, such as sticky purple geranium and silvery perennial lupine. The prevalence of mountain rough fescue, Parry oat grass, and bluebunch fescue distinguish this subregion from the others. Agriculture is the principal land use in the Dry Mixedgrass Subregion, with grazing occurring over about 55 percent of the area and dryland farming (crops, fallow) taking up about 35 percent. Nearly 10 percent is under irrigation, and oil and gas activity is extensive throughout the region. The Mixedgrass Subregion is the most intensively cultivated subregion in Alberta – 85 percent of the region is planted to annual crops. About 5 percent of the subregion is under irrigation. Oil and gas development is common throughout this area. In the Northern Fescue and Foothills Fescue Subregions, agriculture is the primary use of the area, including both annual cultivation and grazing. Other uses include significant oil and gas activity, mining, and outdoor recreation, including motorized vehicle use. AWA hears nothing its efforts to get protected status for Onefour. AWA continues to push the Government of Canada to maintain the lands in their inventory until they have decided they are needed to meet several species at risk recovery plans. AWA has also approached Alberta to ensure the land receives protected status under the South Saskatchewan Regional Plan. Though both levels of government have acknowledged the land’s importance for species at risk no specifics have been forthcoming from either. The Draft South Saskatchewan Regional Plan is officially unveiled. The draft does not address conservation in native grasslands in any specific way; no legislated protection is proposed for grassland areas despite the large number of species at risk in southeast Alberta. AWA argues that Milk River Ridge, Wild Horse Plains and key stretches of wild rivers in the south should be legislatively designated as Heritage Rangelands. AWA learns that sensitive rough fescue and mixed grasslands on the Milk River Ridge are being opened up to exploration activity in the Alberta Bakken oil play. At the same time, efforts to secure legal designation for these lands are being delayed until the Government of Alberta releases its South Saskatchewan Region Plan (SSRP). This comes despite the fact that, in February 2011, the South Saskatchewan Regional Advisory Council (RAC) recommended the Milk River Ridge west of the town of Milk River, adjacent to the Twin River Heritage Rangeland, as a “Candidate Conservation Management Area”. AWA meets with 34 Manyberries area landowners and lease holders to discuss issues affecting grassland species and ranching communities. The meeting is the beginning of a Sage-grouse Partnership. The federal government denies approval of Cenovus’ (previously EnCana) proposal to drill 1,275 natural gas wells and construct associated infrastructure in the Suffield National Wildlife Area. The Government agreed with the Joint Review Panel’s 2009 conclusion that the proposed project would result in significant adverse effects on certain species at risk and would interfere with the conservation of wildlife. Another 14,000 acres of public land in southern Alberta is transferred to municipalities with no public discussion. 2012 spring sage-grouse population counts are released. With only 13 males recorded at Alberta leks, sage-grouse continue to hang on by a thread in the province. Only 18 males were counted at Saskatchewan leks, a dramatic decrease from the 42 males last recorded. New Premier Alison Redford makes good on her leadership campaign promise and scraps the proposed Potatogate public land sale. A short Government of Alberta news release, October 19, 2011, announces: “Government canceled the RFP after people expressed concerns that there was no public input into using a Request for Proposals and that there might be an impact on water and on the ranching community.” AWA is quick to congratulate the premier on her decision. Now a process is needed to ensure that future ‘Potatogate’ land sales are not allowed to go ahead. Designate additional critical habitat as identified on proposed critical habitat maps produced in 2010. No new developments in critical greater sage-grouse habitat. Major concerns are regarding prolonged or expanded industrial development and associated activities in and around critical habitat. Restore existing critical habitat, including removal of industrial infrastructure. To allow for future recovery, previously occupied range outside current critical habitat must be restored to functionality suitable for greater sage-grouse. Any new development outside of critical habitat but within the identified zone of influence (15 kilometres) must not contribute to the disturbance of the species or destruction of critical habitat. In a startling move, the Alberta government announces that the notorious ‘Potatogate” public sale is back on, despite the extensive outpouring of public opposition to the deal. Bids are invited to buy the land, including a requirement that at least half the land must be ploughed up. AWA reiterates its fundamental objection to the proposed land sale, and, once again, hundreds of Albertans begin to write to the government to express their opposition. AWA receives 912 pages of documents under Freedom of Information and Protection of Privacy legislation which sheds some limited light on the background of the Alberta government’s failed “Potatogate” public land sale. At the time that the deal was being discussed, Senior staff from the government’s own Rangeland and Fish and Wildlife Divisions made it abundantly clear that the application should be rejected, but their opinions were evidently overruled. 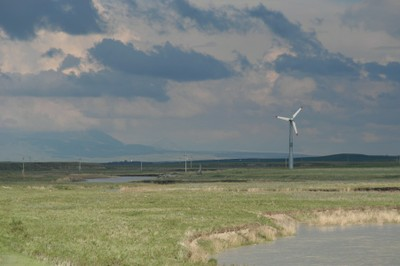 The Foothills Restoration Forum sponsors a wind energy and native prairie field tour and workshop. The workshop follows from another workshop in February 2010 to consider improvements to the Wildlife Guidelines for Alberta Wind Energy Projects (Alberta SRD, 2006). Since then a working group of government, industry, environmental consultants and conservation interests has been compiling background information on policies, principles, guidelines and practices that have been used by other industry sectors to minimize disturbance on native prairie. The document Minimizing Disturbance of Alberta’s Native Prairie by Wind Energy Development is reviewed and discussed. the water implications for new irrigation in an already over-allocated water basin. Alberta Sustainable Resource Development publishes Information Letter IL2010-02, Foothills Fescue Grassland Principles for Minimizing Surface Disturbance. Critical habitat for two wildlife species at risk, the Ord’s kangaroo rat and the Sprague’s pipit, as well as three plant species at risk, the tiny cryptanthe, the small-flowered sand verbena, and the slender mouse-ear-cress, must be finalized. Once critical habitat is finalized, the proposed project facilities should not be located in the defined critical habitat for these five species, unless otherwise permitted under the Species at Risk Act. The Suffield Environmental Advisory Committee, established under the 1975 Agreement allowing gas production in the present-day National Wildlife Area, is not able to oversee a development of this magnitude at present. Its role must be clarified and it must be resourced adequately by the governments of Canada and Alberta to be able to ensure proper regulatory oversight of the proposed project. AWA, Federation of Alberta Naturalists, Canadian Parks and Wilderness Society, Nature Canada and Sierra Club of Canada send petition to the federal Minister of the Environment, calling for protection of Tiny cryptanthe and Sand verbena under the Species at Risk Act. Encana proposes the expansion of industrial development into the CFB Suffield National Wildlife Area (NWA). The environmental review process will test the strength of SARA to protect endangered species on federal land, as the area contains 14 federally listed At Risk species. There are also 78 species listed in a 2000 provincial assessment as At Risk or Sensitive in the NWA. EnCana proposes to drill 300 to 400 new shallow sweet natural gas wells each year for the next three years, totaling 1,275 wells, in the Suffield National Wildlife Area. This will result in 16 or more wells per section and 220 kilometres of additional pipeline, doubling the number of wells in this area. This development means significant new infrastructure, including new access roads, water development, areas for disposal of drilling fluids (sumps), and increased compressor capacity. In response to this proposal, Canada’s Department of National Defence, as the responsible authority, declares its intention to undertake a comprehensive study and provide opportunities for public participation. The CFB Suffield National Wildlife Area is formally established. Land-use activities – including resource extraction, agricultural development, and water management projects – will now be subject to approval and mandatory environmental screening. Assessment and Status Report on the Greater Sage Grouse Centrocercus urophasianus in Canada is published. Sage-grouse is now listed as Endangered in Alberta. Sage-grouse added to Alberta’s “blue” list, as a species that may be at risk in the province, due to declining population numbers (Status of the Sage Grouse in Alberta, 1998). Hunting season for sage-grouse is closed in Alberta (there has been an open season on hunting sage-grouse since 1967). Sage-grouse given “yellow” listing in Alberta, as a species of concern in Alberta, due to their naturally low populations and their limited habitat and distribution ion the province (Status of the Sage Grouse in Alberta, 1998). Sage-grouse open hunting season continues. The Milk River Management Society is founded, with AWA being one of the founding members. Other members come from local government, the ranching community, other conservation groups, and provincial agencies. 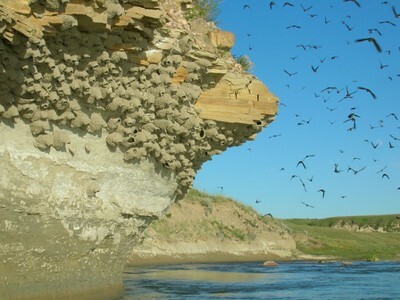 The society holds the lease for the Milk River Natural Area and advises on resource use and management of the Milk River Natural Area and Kennedy Coulee Ecological Reserve. The society is also responsible for administering the grazing contract and long-term research monitoring. The governments of Alberta and Saskatchewan signed an agreement committing themselves to cooperation on ecosystem management, education and park promotion. Thus the Cypress Hills Interprovincial Park becomes Canada’s first interprovincial park. Hon. Don Sparrow, Minister of Forestry, Lands and Wildlife announces the establishment of the Milk River Natural Area—the province’s hundredth natural area. An agreement is signed between the Department of Regional Economic Expansion (DREE) and the Department of National Defense (DND) allowing grazing in the sensitive areas of Suffield. The Canada Wildlife Act is passed in order to protect significant wildlife habitat. The Canadian Forces Base Suffield is established as a live fire training area. However, sensitive areas, including the Middle Sand Hills, are declared off-limits to the military. The Prairie Farm Rehabilitation Agency operates summer and winter pasture to help alleviate the strain of drought conditions on local ranchers. The Cypress Hills Provincial Park is established in Alberta, encompassing the portion of land known as the Elkwater Block. A warden and an assistant warden are appointed to manage it. The Middle Sand Hills area is transferred to the Canadian Research Board for chemical and biological weapons testing. The specific nature of this activity is classified and any possible effects are not known. Suffield is designated Federal Crown land. A large portion of the area is expropriated by the Dominion Government in order to secure the area as a chemical warfare testing ground for the British, who lost access to lands in Algeria following the German occupation of France. Recovering populations of pronghorns result in the closure of Wawaskesy National Park (House of Commons Bill 154). In this same year, the area is declared unfit for agriculture under Alberta’s Special Areas Act. Drought conditions result in the consolidation of small farms into large ranches. The antelope sanctuary is officially designated Wawaskesy National Park, although this land is also initially used for livestock grazing. When livestock pushes out the population of pronghorns, measures are taken to limit the numbers of livestock. 140 km2 of the Middle Sand Hills area is designated as a pronghorn antelope sanctuary. Canadian pronghorn populations are decimated by severe winters. To speed the recovery of pronghorns, refuges are established on federal land in both Alberta and Saskatchewan. The Canadian government promotes settlement and cultivation on the Canadian plains. A first wave of homesteading occurs in 1911 and 1912, a second wave occurs in 1915, and a third wave begins with the return of World War I veterans in 1919, who are given land under the Solider Settlement Plan. Many homesteads in this area are dry and unsustainable, and are abandoned over time. The last great plains grizzly is shot in the Cypress Hills. Cattlemen begin to settle the area. Bison decline rapidly and are virtually exterminated. Blackfoot First Nation signs lands to Dominion of Canada and moves onto reservations. Sitting Bull and his followers escape to the Cypress Hills after the Battle of Little Bighorn. Captain Featherstonhaugh of the British North American Boundary Commission explores the Milk River area. British expedition led by Captain John Palliser explores the Middle Sand Hills area. 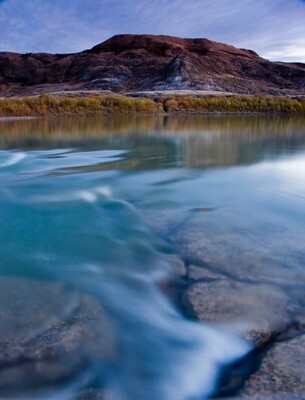 The Milk River is named by Captain Meriwether Lewis for its muted colour, similar to the colour of tea with milk. Anthony Henday becomes the first European to traverse the Cypress Hills. It is my belief that Non-profit organizations like the Alberta Wilderness Association provide a clear framework that creates opportunities for Albertans to actively participate in the protection of their provinces resources.